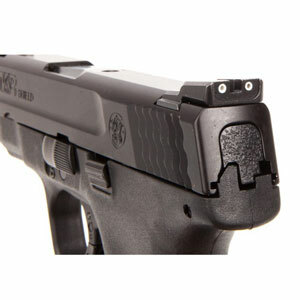 Night sights can be a great addition to your M&P shield, especially if you use it as a home-defense handgun. These sights will allow you to shoot in all kind of light conditions, and they are very effective. But did you know tritium night lights can produce enough light to allow you to aim in complete darkness? We hope that by the end of the article, you’ll be able to make an informed decision on which are the best M&P Shield night sights! In the following article, we present the top 6 night sights currently available on the market for the M&P Shield. Further, in the article, we explain how the sights’ different features can influence your shooting experience. Features : Glows-in-the-dark. No batteries required. The Meprolight night sight replaces your standard iron sights and it comes with a 12-year illumination warranty. These night sights use tritium gas to remain bright in low-light conditions, and they don’t need batteries to work. One of the advantages of using this night sights for your M&P Shield is that they’re lightweight and they won’t interfere with your handgun’s normal balance. The Meprolight front sight has the exact height of the standard iron sight, so you won’t have to adjust your aiming when using it. The sights are fairly easy to install, and they will fit the Shield perfectly. The sights perform well in low-light conditions, but they excel when you use them in complete darkness. The rear sight is large and stable enough to allow one-handed racking. 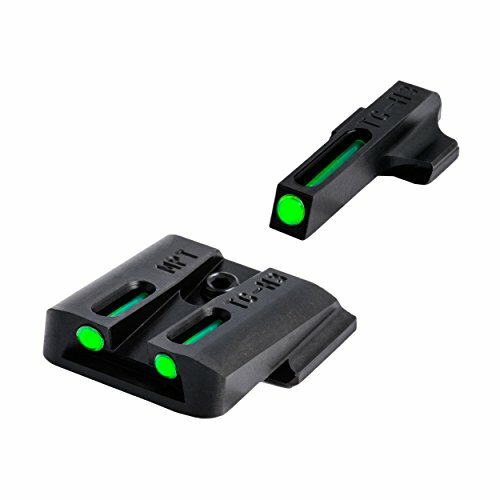 Overall, the Meprolight night sights are very effective, and they come at a great price. The Truglo sight set offers a great visibility in both low-light and bright conditions. These sights have a compact design that makes them fit in most standard holsters, and they use high-quality tritium to remain bright when you’re aiming in the dark. A great thing about this sight set is that it’s made out of machined steel. Not only will the steel construction offer it durability, but it will also make it more reliable as time passes. The sights’ tritium fiber is concealed, so your target won’t be able to spot your handgun in the dark when you’re aiming. The tritium used for these sights has a great quality, and it will remain clear and bright for a long time. This sight set is large enough to make target acquisition easy, but it’s small enough to avoid getting caught in your clothes when you draw. All in all, this sight set can be a perfect addition to your M&P Shield. The XS Sight Systems tritium sights for the M&P Shield are great for beginner and experienced shooters alike. The front sight is large, larger than the stock front sight, and that makes the target acquisition easier and quicker. The front sight uses a white ring that’s surrounded by green tritium to facilitate your shooting in all light conditions. One of the advantages of using these sights is that they have a rounded design that won’t snag and that won’t interfere with your draw. The low profile design will also allow the sights to fit in most standard holsters without any problems. The rear sight features a shallow V design and a white vertical stripe that will help you acquire your target. The white stripe does not contain any tritium, but it will reflect the light, helping you aim in low-light conditions. These sights are made out of blued steel, so they’re pretty durable. They are easy to install, and you won’t have any problems installing them without the help of a gunsmith. The bottom line is, these sights are great and come at an accessible price, so they have a really high value. This Truglo sight set uses a fiber optic technology to perform well in low-light conditions. The sights are made out of machined steel, so they are very durable and should last for a very long time. A good thing about this model is that it has a snag-resistant design, so you won’t have any problems with your draw. The sights’ low profile will allow you to draw without any interference, and it will also allow you to use standard holsters for your M&P Shield. Another good thing is that the optic fiber is concealed from the target, so it won’t be able to spot your location when you aim. The rear and front sights come in contrasting colors, which will facilitate your target acquisition. Not only will the contrasting colors stand out better when you’re aiming, but they will also be more visible in low-light conditions. Overall, these sights are very good and they come at a really cheap price. Trijicon is one of the world-renowned sights and optics manufacturers. Their products are reliable and very efficient. As you would expect, the night sights they produce for the M&P Shield fit in this pattern. 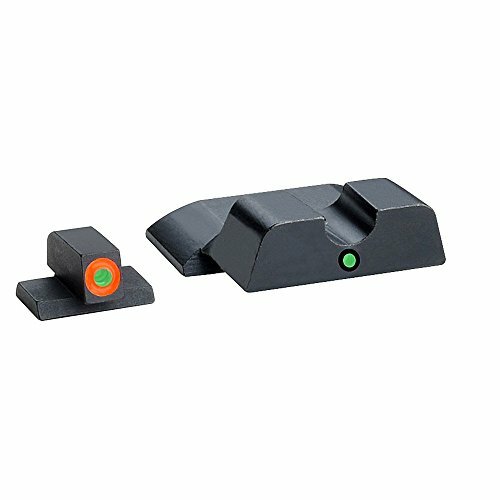 This sight set offers a high colored front sight and a subdued rear sight. The front sight uses a photoluminescent paint that will help you acquire your target and aim in low-light conditions. The rear sight is angled so it will reduce the glare, and it comes with two painted rings that will help you focus on the front sight. The rear sight has a U-notch design, specially intended to enhance the front sight. The three-dot design will help you acquire your target easily, and the tritium-filled lamps will allow you to aim in low-light conditions and even in full darkness. The rear lamps have a different color from the front lamp, so you will be able to acquire your target easier and faster than before. All in all, these are some of the best night sights currently available for the M&P Shield, and they’re well worth their price. The AmeriGlo tritium sight set has a good design that will allow you to acquire your targets in low-light and full darkness conditions. The rear sight has a U-notch design and a tritium lamp that you can use to aim in all kind of light conditions. When you’re aiming in low-light conditions or in the darkness, you can simply align the rear and front tritium lamps to acquire your target. One of the advantages of using this sight set is that it comes with high-quality tritium lamps. The lamps will provide a good illumination for a long period of time, and you can use the sight set for years on end. The front lamp is surrounded by a reflective ring, so it will be very visible in all kind of light conditions, including in the midday sun. The orange paint stands out easily, and it will improve your target acquisition. Overall, this sight set is very good and it comes at an affordable price. Finding the best night sights for the M&P Shield might be more difficult than most people think. As you could see from our short reviews, the models currently available on the market have different designs, and they use more than one technology to produce the illumination necessary to aim in low-light and darkness conditions. 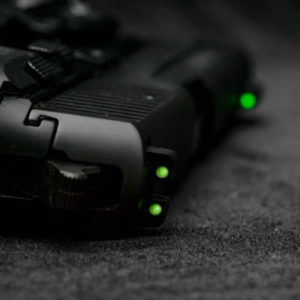 In the following section, we explain how each characteristic of the night sights can influence your shooting experience, and how to find the best night sights for your needs. Even though the night sights are perfectly suited to help you acquire your target at night or in low-light conditions, you still have to be able to take aim using them. Now, there are a lot of different sight designs, and you should choose the night sights according to your personal preferences. 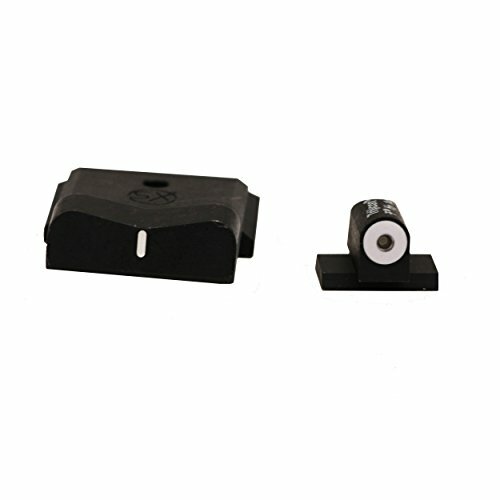 U-notch – The U-notch is one of the most popular designs for the rear sight. To take aim using this type of sights, you have to align the U-notch and the front sight to your target. Nights sights that have a U-notch (youtube video) design usually enhance your aim and target acquisition time by using tritium lamps of different colors on the rear and front sights. The contrast between the colors will make it easier to focus on the front sight and acquire your target. Patridge – The patridge sights are similar to the U-notch, and they’re just as popular. Even though they use the same principle, the patridge is slightly different from the U-notch. Instead of having a semicircular design, the rear sight has a design resembling the bottom of a square. Both the front and the rear sights are slightly shorter than the U-notch, so the sights will have a lower profile. Night sights that have a patridge design use three tritium or fiber optic lamps. To acquire your target in low-light conditions, you have to center the front lamp between the two rear ones. Manufacturers usually use different colors for the front and rear lamps to enhance your aim and direct your focus towards the front sight. V-notch – The V-notch is similar to the previous designs. The only difference is that the rear sight has a “V” shape. One of the advantages of using this type of night sight is that it can come with an additional reflective line placed where the arms of the “V” connect. This reflective line can help you center your target easily, and it can improve your aim. These are the most popular designs of iron sights. However, they are not the only designs available. You should choose a design you’re comfortable with, and you should always make sure your sights are properly mounted on your handgun before using them. Keep in mind that the sights’ design will influence its size. If the sight is too big, it might make your M&P Shield unsuitable for standard pistol ankle holsters. Tritium Lamps or Fiber Optic? 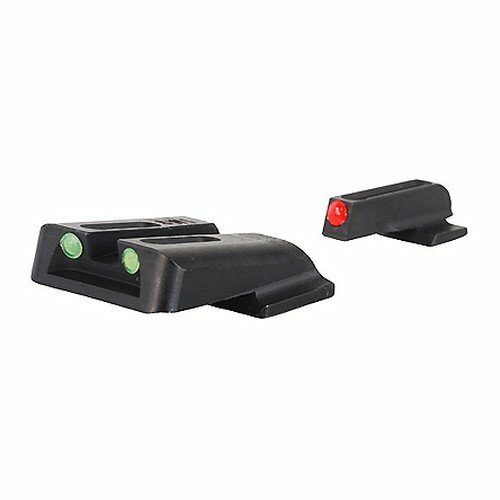 There are two main types of lamps night sights manufacturers use. Both the tritium and the fiber optic sights offer certain advantages and disadvantages, but which one is better? Fiber Optic – Fiber optic sights tend to be cheaper than the tritium ones, but the price difference is sometimes not very large. These sights are great for target practice, and they will last for a long time. In fact, since the fiber optic lamps are covered by a think layer of protective paint, they will last indefinitely if you take good care of them. One of the advantages of using fiber optic sights is that they’re very versatile. You can use them in all type of light conditions, from dawn till dusk. They’re reliable and accurate, and they can improve your accuracy. Another advantage is that these type of sights use different colors for the front and rear sights. This means that once you’re used to focusing on the front sight, you will be able to acquire your target much quicker than you would when using normal iron sights. However, not everything is perfect about these sights. Unfortunately, fiber optic sights do not produce light on their own. They only reflect the light, no matter how low that light source is. This means you won’t be able to use these sights in full darkness conditions. This might be a disadvantage if you’re planning on installing this type of sights on home protection M&P Shield. Tritium Lamps – Tritium is a radioactive gas, but don’t worry, the amount of tritium in your night sights won’t be harmful to your health. Tritium is used by sights manufacturers because it has the capacity of producing a small amount of light. One of the advantages of using tritium sights is that you’ll be able to use them in low-light conditions and even in complete darkness. This can be very helpful, especially if you’re planning on installing the sights on your home-defense handgun. Even though they produce a small amount of light, tritium lamps are normally not visible in daylight. That’s why manufacturers usually encircle the lamps in reflective materials. This will make the sights visible during the day as well as night, so you will be able to use the M&P Shield at all times. The main disadvantage of using this type of night sights is that you can’t use them forever. Tritium has a half-life of about 12 years, so once it reaches this age, it will get dimmer than it is originally. As you could probably notice from our short reviews, night sights are made out of different materials. All of them provide certain advantages and disadvantages. Steel – One of the main advantages of using steel night sights is that they’re very durable. Even if you’re careful when you’re using your M&P Shield, you can still drop it or bang it against a wall from time to time. Using steel night sights will allow you to do these things without having to worry about harming the sights. A downside of choosing steel iron sights is that they’re usually more expensive than the night sights made out of other materials. However, if you’re looking for high-quality sights you’ll be able to use for years on end, steel is the answer. 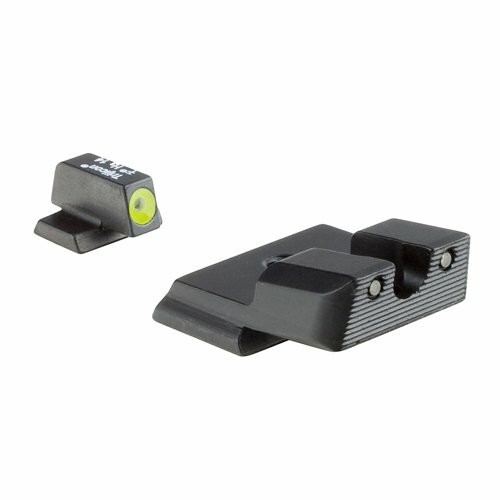 Aluminum – Aluminum night sights provide a nice balance between durability and price. 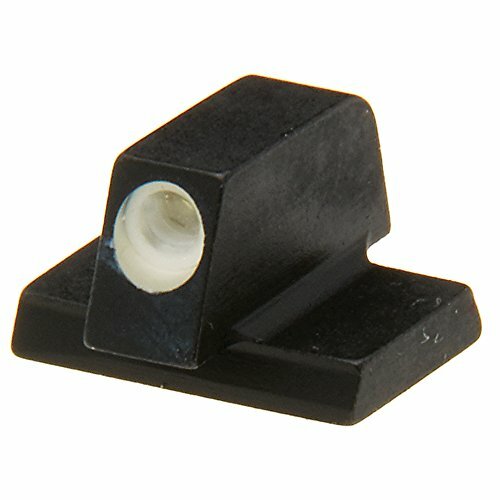 While not as durable as steel night sights, aluminum ones are still capable of going through the occasional wall bang or drop without any problems. Aluminum is also cheaper than steel, so most aluminum sights will be cheaper than steel ones. Of course, this also depends on the manufacturer and the illuminating technology they use. Plastic – Even though most of the leading sights manufacturers avoid using plastic for their products, you can still find plastic sights on the market. The main advantage of plastic sights is that they’re cheap. Unfortunately, these sights usually have more disadvantages. One of the disadvantages of using plastic sights is that you can actually break them while you’re installing them. This is especially true if your M&P iron sights seem to come off really slow. If you try to force the plastic sights in their place, you might end up breaking them before you actually put them to use. However, plastic night sights can be perfect for beginner shooters. If you’re not certain you want to upgrade your iron sights to night ones, you can simply buy a cheap plastic model and give it a try. If you’re not happy with the result, you can always switch back to the iron sights. If you are, you can upgrade the plastic ones to an aluminum or steel model. One of the advantages of using an aftermarket set of sights is that you can choose one that can actually enhance your accuracy. One of the ways you can do that is to test different types of night sights designs. Some people shoot better when they use a V-notch as opposed when they align the dots. Others perform better if they use a U-notch. Every shooter is different, so it’s only natural to have different preferences. Another way to improve your accuracy is to use user-friendly sights. These sights might seem more appropriate for beginners at a first glance, but since you’re planning on using them in low-light or night conditions, they can be very helpful even for professionals. Some sight sets come with an enlarged front sight that will immediately stand out when you’re acquiring your target. This can be very helpful if you’re trying to shoot accurately in low-light conditions, and it can make a world of difference if you’re aiming in complete darkness. Now that you know all about the sights’ design, material, and size, let’s take a quick look at other aspects you should take into consideration before deciding which is the best night for your M&P Shield. Size And Weight Are Related – If you choose a larger set of sights, it will most likely be heavier than the standard iron sights your Shield came with. This means you’ll have to practice shooting with your new sights until you feel comfortable using them. Nights Sights Should Be Used During The Day – Make sure you practice aiming with your new sights during the day as well as during the night. This is especially important if you’re planning on installing the sights on your home-defense handgun. Durability Is Important – Even if you believe you won’t ever drop your M&P or bang it against a wall, the night sights still have to be durable enough to handle the gun’s recoil. You might believe that the recoil is not very powerful, but the sights have to be able to handle it for a long time while maintaining their accuracy. The Sight Is Bright Enough For You – The brightness of the night sight is very important. Whether you choose a tritium lamp that produces its own light or a fiber optic one that reflects the ambient one, you have to make sure the sights are bright enough for you. Every shooter perceives the brightness differently, so what seems to be a bright sight for others might be dim for you. Fiber Optic Sights Work Well With Flashlights – Since fiber optic sights need a source of ambient light, you can always pair them with a tactical flashlight. The flashlight will provide enough brightness to illuminate the fiber optic sight. You can always use a pistol light instead of a flashlight. The results will be similar. Make Sure The Sights Are Installed Properly – If you don’t have any previous experience with mounting new sights, you can either use video tutorials or visit your local gunsmith to change your standard sights with your new ones. Make sure you don’t damage the sights while you install them, and that you have all the tools you need to change them. $$$ Snag resistant design Swiss Tritium 5.8 x 3.8 x 0.8 inches Glows-in-the-dark. No batteries required. As you could see from our short reviews and the buying guide (we have a similar guide for Glock night sights as well), finding the best night sights for M&P Shield can be difficult. Every design offers certain advantages and disadvantages, and you have to take into account everything, from the unit’s construction material to the installation process. We hope that this article brought some light on how to choose the right model for your preferences. Keep in mind that aftermarket sights will most likely have a different weight than the standard ones, so make sure you get enough practice after you install them.